High school is fixture of TV life. We know all the clichés and the cliques, and we almost have a sort of tradition of following these in American television and movies. Characters, like real kids, fight for popularity; nerds get revenge, jocks are sensitive jerks, and a girl becomes pretty by taking off her glasses and no longer living like a wallflower. Sometimes these stories are told in musicals, sometimes intensely artful adventures. The irony is, we know how unrealistic these story lines are, yet they still get high ratings and reviews. The UK’s Channel 4’s “Skins” was a notable and wildly popular divergence from these arcs, but the characters still live charmed, stick-thin lives until the final seventh season when reality and adulthood finally tear them down. Are any of these shows and movies actually helping anyone out there? Is there any different, positive and entertaining show that doesn’t turn away from teenage tragedy without turning off audiences? The answer is “My Mad Fat Diary,” starring Sharon Rooney as Rae Earl, a non-traditionally-beautiful lead who is coming to grips with life’s realities after a stay at a mental hospital. Rae does not conform to common cultural notions of femininity and beauty that are the source of nearly every woman’s anxiety. She simply aims to be herself for her well being, but her character’s narrative highlights that that it’s not always easy to accept your true self. Even more refreshing is that everyone else in the series, no matter the first impression they make on the audience, has their own dark struggle, including the usually widely ignored issue of mental illness. This does not mean that they take out the frustrations and problems à la the dramatic “Skins” Effy, Freddie, J.J. and Cook; rather, we watch how adolescences and adults alike are affected and cope. 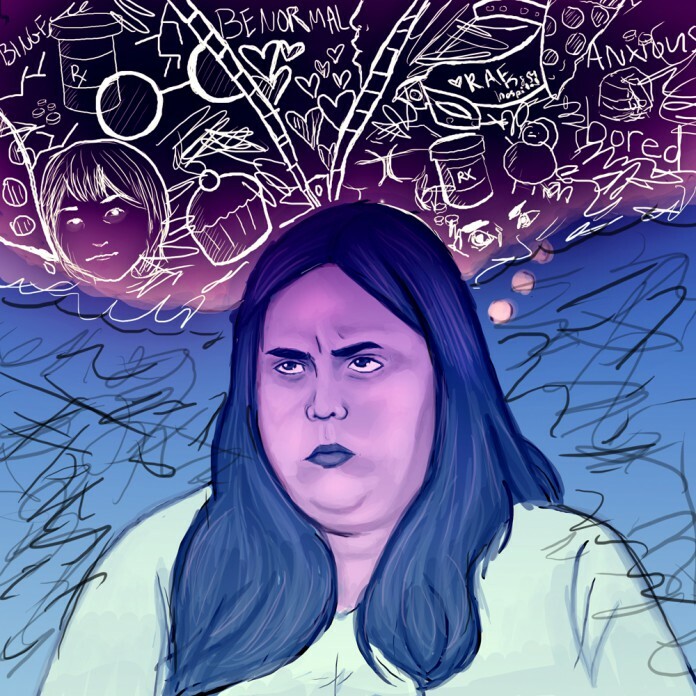 “My Mad Fat Diary” addresses the struggles of adolescence without romanticizing or being overdramatic, and it is unflinchingly honest about reality and consequences. The show simultaneously provides solutions and legitimate advice for people who may face similar struggles without coming off as didactic. While the title and the British accents might make you think of “Bridget Jones’s Diary,” you’d be mistaken to compare the two. Sharon Rooney plays Rae with her body as it is, and she didn’t change herself or make headlines like Renée Zellweger did for her fluctuating weight. The story is not a modern take on classics, but is based on the real-life Rae Earl’s diaries. And while Rae is certainly funny like Bridget, her world is not all comedy. This show is about more than weight; it’s about how women are valued. Although there’s only so much cultural and racial diversity to be found in the English countryside, the diversity of individual personalities and struggles outside archetypes shines through. While “Skins” took seven seasons for life’s responsibilities and the realties of self harming behavior to hit select characters hard, “My Mad Fat Diary” stands out in teenage TV history for taking these issues head on, right out of the gate. Rae is a hero worth rooting for while she works through her problems, pieced together through therapy visits. “My Mad Fat Diary” is a resounding step in the right direction for the representation of women in the television industry–something we need more of here in the U.S. The lack of female leads with different bodies, who present the diversity of types of beauty and real problems, harms women and their self worth. American teenagers consume over 10 hours a day of TV, movies, music, magazines, and Internet. The Representation Project reports that 53 percent of 13-year-old girls are unhappy with their bodies, and that worse, that number increases to 78 percent by age 17. The numbers continue to connect to the media’s current destructive impact on viewers’ self-esteem. As viewers and consumers, we have the power to reverse that by demanding the inclusion of all kinds of people in our media, so that it better reflects the beauty all around us and within each of us.